Writing a historical novel requires, in addition to the creation of a fictional story, knowledge of the setting during the time the story takes place. According to the Encyclopedia Britannica, such a novel is one “that has as its setting a period of history and that attempts to convey the spirit, manners, and social conditions of a past age with realistic detail and fidelity to historical fact.” It may, as with ILLUSIONS OF MAGIC, portray a societal view “in which great events are reflected by their impact on the private lives of fictional individuals.” Composing such a novel, then, requires knowledge of the historical period, which is usually acquired by research. This page describes some of the research that contributed to ILLUSIONS OF MAGIC. Prior to the first draft of what became the novel, J.B. Rivard came across an account of the attempted assassination of Franklin D. Roosevelt during a 1933 political speech. It occurred on February fifteenth, shortly before his inauguration in March of that year as the 32nd President of the United States. 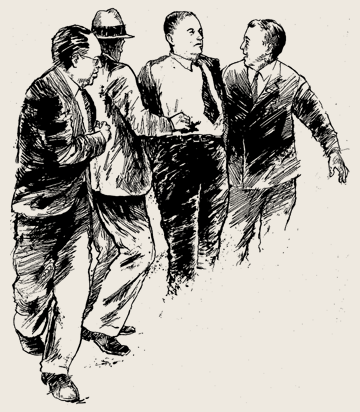 The assassin’s gunfire, though it missed FDR, wounded Chicago’s mayor, Anton Cermak, and several others attending the President-elect’s brief remarks at Bayfront Park in Miami, Florida. The Mayor survived for nineteen days, then died. The shooter, Giuseppe Zangara, was an unrepentant Italian immigrant who was later executed by the state of Florida. These events alone might form the background for a novel set in Chicago at that time. But Chicago was at the same time undergoing the privations of the Great Depression and had yet to recover from its dalliance with the Gangster era. Also, during those weeks when Mayor Cermak lay wounded in Miami’s Jackson Memorial Hospital, Chicago politics—always a hot topic—was made even hotter by political maneuvering such as the city had never before known. This clearly was a dangerous, fascinating and tumultuous period in which to set a Chicago novel. Franklin D. Roosevelt was Governor of New York in the summer of 1932. He became the presidential nominee on the fourth ballot of the Democrat Party. He promised change via a number of unspecific measures to combat the suffering and hardships of the Great Depression. Herbert Hoover, the incumbent President, defended his stewardship during the economic downturn and was nominated by the Republicans on the first ballot. However, Roosevelt was elected by a large margin. Anton Cermak was born in 1873 in a Bohemian village about fifty miles from Prague, and immigrated to Chicago at age eleven with his family. He was ambitious, was elected to alderman in 1909 and used his position to make himself rich. Later, he put together a powerful coalition of immigrant groups based on anti-prohibition rhetoric that promoted the name “the house for all peoples,” and overwhelmingly defeated William “Big Bill” Thompson (who’d brought horses into City Council chambers to prove his prowess) for mayor in 1931. Some said it was not that Cermak was so good, rather that Thompson was so bad. Less than two years later Cermak was dead. However—and this is not well known—the City of Chicago possessed no written legal procedure for replacing a deceased mayor, leading to unprecedented political uncertainties. Some in the City Council argued that a special (general) election for mayor should be held, while others said a pro-tem mayor should be elected from its own membership by vote of the City Council. The names of aldermen Thomas Doyle, John Clark, J. M. Arvey and James Bowler were rushed forward as potential candidates. Others implored the State Legislature to solve the dilemma by passing State legislation on an urgent basis. On March 7, 1933, the day after Cermak’s death, the Democrat Central Committee met at the Morrison Hotel to map strategy, while Republicans met at the Bismark Hotel to discuss their options. Nothing was decided, although numerous proclamations regarding the “proper” procedure were delivered by spokesmen for the two sides. Thus began a week’s worth of frenzied negotiations led by Pat Nash, Cook County Democratic Chairman, who pushed for the naming of Frank J. Corr—a classmate of Illinois Gov. Horner at Kent College of Law—as interim mayor. He was opposed by a group backing Alderman John Clark, from the 30th ward. Despite a warning from counsel William H. Sexton that aldermen have no legal power to elect a mayor pro tem, an election by members of the City Council was held March 15, nine days after Cermak’s death. Alderman John Clark lost and Frank J. Corr was chosen as interim mayor. Less than a month later, he resigned in favor of Edward J. Kelly who, with Pat Nash, formed the Kelly-Nash machine that effectively ruled Chicago well into the 1940s.